A woman who has been married to a British man for 27 years is being held in a Scottish detention centre prior to deportation. 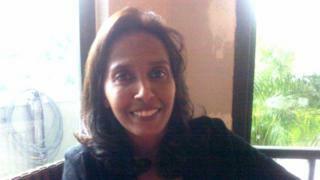 Irene Clennell is originally from Singapore and has two British sons and a granddaughter. She lives with her husband John in County Durham and was detained at a routine appointment at an immigration reporting centre in Middlesbrough. The Home Office has said it does not comment on individual cases. Mrs Clennell was given indefinite leave to remain in the UK after her marriage. But periods spent back in Singapore caring for her elderly parents appear to have invalidated her residential status. She said she has made repeated attempts - both in Singapore and back in the UK - to re-apply for permission to live with her husband. During a visit to the reporting centre in Middlesbrough last month, she was detained and brought by van to Dungavel House, a detention centre in Lanarkshire. She was told her detention was because she had failed to make her own arrangements to return to Singapore. She said: "The kids are born here. My husband is from the country. "So I don't see what is the issue. But they keep rejecting all the applications." Mrs Clennell said her husband is in poor health and she has become his principal carer. She added: "My granddaughter - I want to see her grow up. "And my husband is not getting any better. I want to be with my family. "If I do go back, I don't know when I'll be able to see them again." Irene's husband John, a former gas engineer, said he is now struggling with poor health. "She's been looking after me because I'm unwell," he said. "Since Irene's been detained my mum's been coming over to get my meals and so on." He is still hoping his wife will be allowed to return to their home in County Durham. He added: "I think she should be allowed to stay. She's part of a married family." Director of Migrant Voice Nazek Ramadan said: "Irene Clennell's case is like many others we've worked with. It's yet another example of how arbitrary policies tear apart families and ruin lives. "These kind of bureaucratic decisions are a direct result of a relentless drive towards unrealistic migration caps that don't take real lives into account. "Most people in Britain will recognise the need for a compassionate system flexible enough to take family life into account. We urge the Home Office not to break up a family that have made this country their home for decades." The Home Office said all applications for leave to remain in the UK are considered on their individual merits and in line with the immigration rules. A spokesman added: "We do not routinely comment on individual cases."